Another point to note is that since Savings Account Interest is de-regulated, the interest on SB Accounts also vary and is not fixed. Which means now if the bank has set the interest rate at 6%(increasing interest rate scenario) .It can also reduce below 3.5% also when interest rate dives low. My personal feeling is, there will always be a gap of at least 1% in Favour of Liquid Funds compared with SB account. Recent hike in Dividend Distribution Tax to 28.3% (including Cess & Surcharge) may make many wonder SB Account with its upto Rs.10000/- Interest as Tax Free a better option. I beg to differ for 2 reasons. I normally advise investors to keep 1/3rd of Contingency Fund in Liquid Funds. 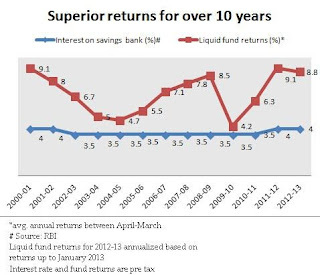 After all, an 8% return with 1 day Liquidity is always much better than a 4% in SB Account!